In an effort to fix and replace more than 1,000 structurally deficient bridges in Wisconsin, officials with the state Department of Transportation has changed how they reimburse local governments. But in Chippewa County, the new policy delayed work on a bridge that partially collapsed in mid-May. The 195th St. bridge in the Town of Lafayette has been listed as structurally deficient for seven years. Between 600 and 800 vehicles crossed the bridge each day until several of its steel pilings broke on May 13 causing noticeable sagging. 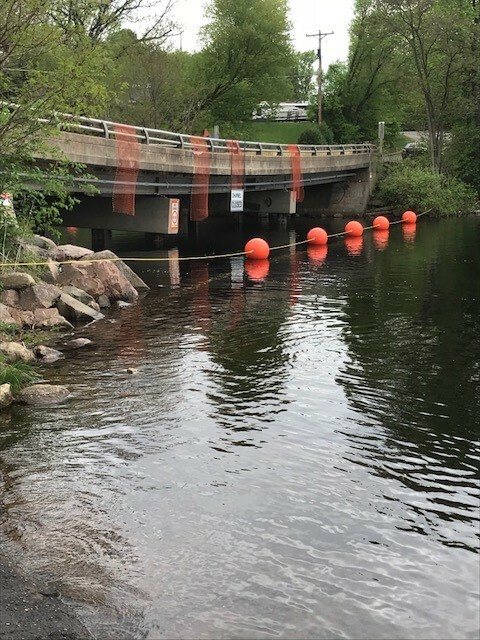 Town Board Chair David Staber said the bridge was closed immediately and after state and federal transportation officials inspected the bridge, boat traffic was closed underneath the structure, which crosses the eastern edge of Lake Wissota. Staber said seven years ago, a kayaker noticed pitting and holes in the steel pilings when the water was low. After divers inspected the pilings, the bridge's weight rating was reduced from 40 tons to 18 tons. An inspection of the bridge last October gave it a sufficiency rating of 21.9. A rating of 50 or less is considered structurally deficient by the Federal Highway Administration. Officials in the Town of Lafayette worked with Chippewa County and ultimately, the state DOT on designing a replacement. Staber said they hired a local engineering firm that suggested a design that included widening the roadway leading up to the future bridge, which the DOT approved in 2016. But in 2017, the state adopted a new policy known as "Replace-In-Kind" that aimed to standardize what the state reimbursed local governments in an effort to spread money to more bridge projects around the state. Staber said the initial estimate for the approved bridge design was $1.7 million, which included widening the roadways leading up to the span, but the new DOT policy wouldn't pay for the added work costs. The DOT told Lafayette and Chippewa County officials to submit a new design that would be closer to $1.1 million. "They knew about that when we designed the first bridge, that we were going to match these existing pavements," said Staber. "Well, then when it came back so high, they said, 'No, you can't go back that far. You're going to need to keep this bridge a little bit wider than it is now but you can't match existing pavements.'" Staber said they submitted a pared down bridge design that came in at $1.3 million, which pushed the project timeline back from 2019 to 2021. He said the town and the county will have to split the additional $200,000. "I wish they would have told us that before we designed or put in an application for bridge repairs the first time because we would have come in at the $1.3 million before and the bridge probably would have already been replaced," said Staber. In the wake of the partial bridge collapse, DOT officials have accelerated the timeline to have the bridge replaced sometime next year. June Coleman, WISDOT Local Programs and Finance Section chief, said the new "Replace-In-Kind" policy is aimed at moving state funds to more bridge projects by setting limits on things like approach work improvements. "'Replace-In-Kind' is a funding policy that was developed last fall to find a way to maximize the number of local bridges that could be replaced in the course of a year by applying a criteria to it that really allowed those dollars to go farther," said Coleman. Things like widened bridges and approaches are still reimbursed, said Coleman, but only if they're deemed necessary to conform with new engineering or safety standards. She said in the past the state reimbursement for improvements included in bridge replacement designs were approved on more of a case-by-case basis. "Those bridges were funded with what they were asking for but that could be a more costly bridge and then another bridge, the funds wouldn't be available to fund those bridges," said Coleman. In a press release issued by Gov. Scott Walker's office on Friday, Walker announced $76.4 million in state aid going to 113 bridge projects scheduled for a program cycle running from 2018 to 2022. The current state budget included an increase of $20 million to the DOT’s local bridge program. "We are providing the largest increases to local road and bridge aids in 20 years," Walker said in the news release. "The Department of Transportation achieved critical savings for Wisconsin taxpayers and moved up projects. Thanks to these efforts, our dollars will go further, and that means more bridges to connect people across Wisconsin." WISDOT Secretary Dave Ross, who was appointed to lead the agency last year by Walker, echoed the governor's applause of the "Replace-In-Kind" program and other efficiency measures taken at the agency. "The department focus is on right-scoping projects," Ross was quoted as saying in the release. "This means we're going to build exactly what is needed to achieve safety and to improve the transportation infrastructure." Since the partial collapse of the 195th Street Bridge in Chippewa County, officials with the DOT, state Department of Natural Resources and Federal Highway Administration, along with local lawmakers, have been meeting about replacing the bridge next year. Staber said they hope to have the existing structure removed before July 4.